Can Fast Acting Yeast Be Used in Place of Active Dry Yeast? 4 Can Fast Acting Yeast Be Used in Place of Active Dry Yeast? 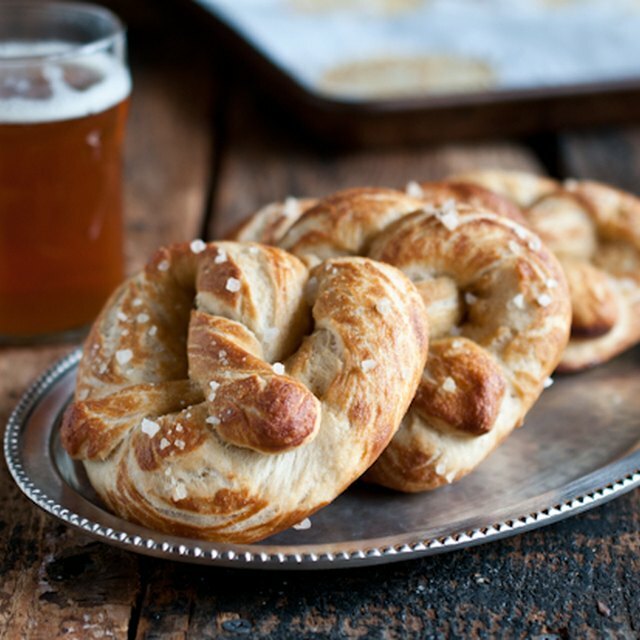 Hard pretzels may seem like an item you can only purchase in plastic bags from the snack aisle, but you can make them at home with a yeast-based dough. Homemade pretzels tend to have a softer texture, but if you alter the cooking technique, the dough will become crunchy without being burnt. It may be more effort to make your own hard pretzels, but you’ll eliminate the artificial preservatives you’d get from processed pretzels and you can control the sodium amounts. Pour 1-3/4 cups water into a small saucepan on your stovetop and position a thermometer into the water. Set the temperature to “high” and heat the water until it reaches approximately 110 degrees F. Transfer the water into a large mixing bowl, then add 2 tsp. of salt and 1 tbsp. of granulated sugar. Stir the ingredients together, then add 1/4 oz. of active dry yeast directly on top of the mixture without stirring it in. Let the yeast sit undisturbed for about five minutes or until it starts to bubble. Insert the dough hook attachments into an electric mixer and position the mixer into the yeast mixture. Turn the mixer to “low” and slowly pour in 4 cups of flour and mix until the flour is evenly distributed throughout the mixture. Increase the speed to “medium” and mix for five minutes or until the dough is soft and pliable. Pour 1/4 cup of olive or vegetable oil into a second large mixing bowl and use your hands to spread the oil evenly across the bottom and sides of the bowl. Transfer the dough into the oiled bowl, then drape plastic wrap across the top. Let the dough sit for about one hour or until it rises to twice its original size. Spread a thin layer of olive or vegetable oil onto a cutting board and place the dough onto it. Separate the dough into about 35 to 40 equal portions, then use a rolling pin to flatten each piece to about 14 inches long. Set your oven to 350 degrees Fahrenheit. Place a large roasting pan (or pot large enough to fit the pretzel sticks) onto your stovetop and add about 3 to 4 cups of water. Turn the stove to “high” and heat the water until it starts to boil. Place parchment paper onto two baking sheets. Add just enough pretzel sticks to the water so they don’t touch (about six at a time) and heat them for 30 seconds so the outside of the dough can firm up without overcooking the inside. Use a slotted spoon to remove the pretzel sticks and place them onto the baking sheets. Repeat with the rest of the pretzel sticks. Crack one egg into a medium bowl, then add 1 tbsp. of water and whisk the mixture until it’s smooth. Use a pastry brush to spread the egg mixture across the pretzel sticks, then cover them with a light layer of coarse salt. Bake the pretzels for about 50 minutes to one hour or until the tops are browned and they have a crunchy texture. Keep homemade hard pretzels at room temperature in an airtight storage container for up to seven days. Do not use water that is not approximately 110 degrees F or else the dough won’t rise properly and the pretzels will become dense.